We have completed our properties unit! Yay! Each unit completed is another week closer to summer! 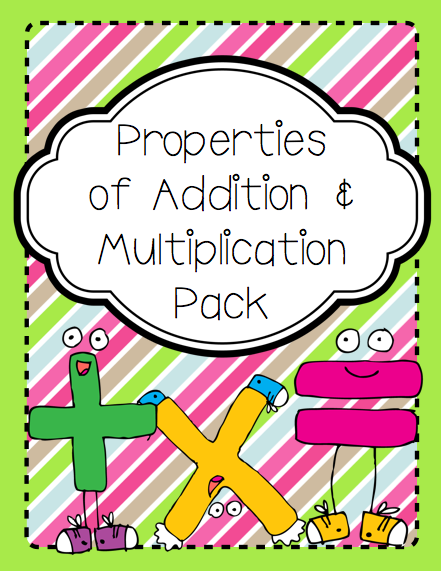 I have kept the items that I use for teaching the properties of addition and multiplication all together, so I created a pack with all of them included! 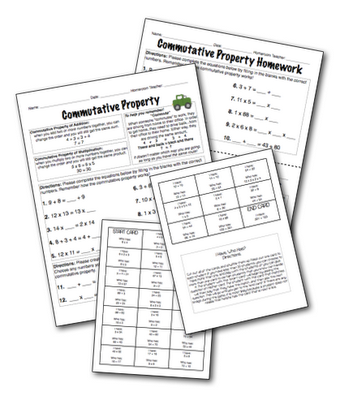 I have a class work and home work for each property, as well as two games/activities included. We also create a foldable for this unit using the definitions and 'memorization tricks' I have for each property (which you can find on the class work pages). To get this unit, click HERE! download the first day of this unit by clicking the image below! Hooray!! 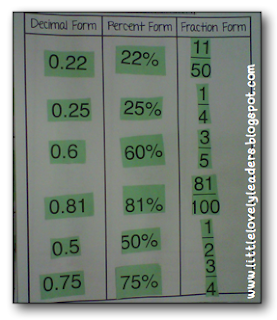 Decimal, Percent, and Fraction Fun!! 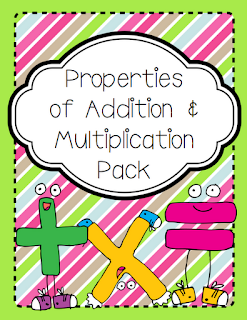 I have been using my thinking cap for ways to make my converting decimals, fractions, and percents unit FUN, while still giving the kids plenty of practice...and I think I succeeded with this activity pack! My students had so much fun with it, and I had some of the best quiz scores I have had so far this year! The key to these great quiz scores...games, record sheets, and partner discussions! I am sorry in advance for some of the old, dark photos in this post! I took updated photos and I can't find them all! Only some are showing up...ugh, technology! 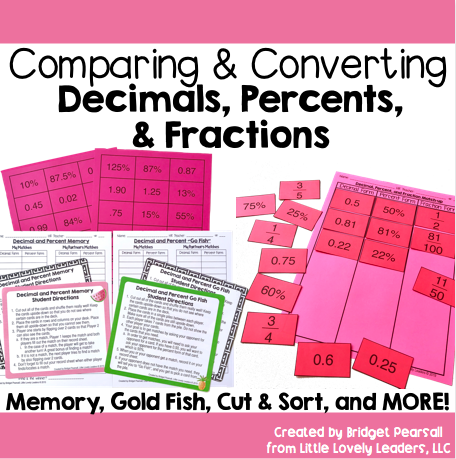 Comparing and Converting Decimals, Percents, and Fractions activity pack. 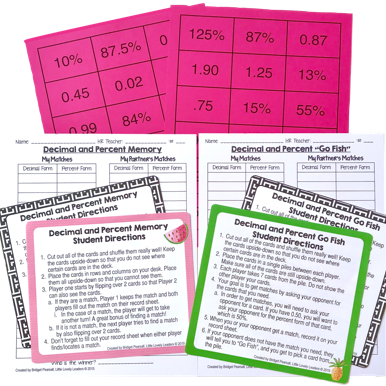 Copy the cards on colored paper to ensure that students don't see through the paper during the Memory and Go Fish games. Students cut out the cards and turn them upside-down in rows/columns, just like the old fashioned memory game we all know and love :) The great part about this is that the cards are already mixed up on the cut out sheet. 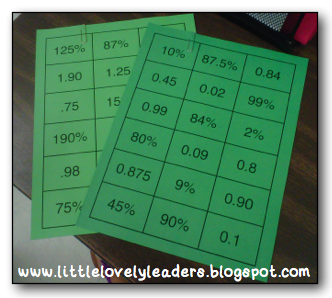 This way, you can give the sheets to the kids to cut out without worrying that they are already seeing the given answers. Since these are partner games, it works perfectly that it is two sheets to cut out. 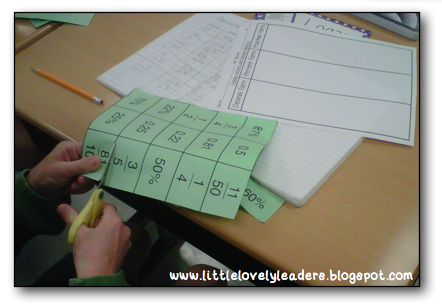 Each partner can cut out a sheet and then the kids are ready to play! Students can use the instructions sheet given in the pack (in color and black/white versions) at a math center, or you can play this whole group by partnering up your students and simply explain it out loud to everyone. I do it this way usually, and then I leave the written directions under my document camera so that the kids can refer to it if there is a misunderstanding about the rules. 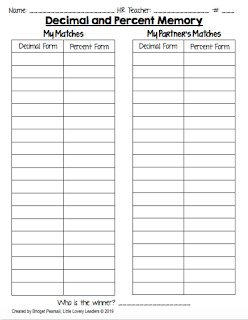 Use these record sheets to have the students fill out their matches/pairs. You can each walk around, observing your class while they play, and see the pairs they have found so far to make sure the students are playing correctly without having to interrupt them. It also makes sure that the students are always paying attention to the pairs their opponent is finding, as well! Holding them accountable for their pairs, as well as their partner's, is so important in math. Details can easily be overlooked and if they trust their partner, they may just "believe" them when they say they found a match...if they are forced to write it out, then they will be more active in making sure their partner is correct. I just LOVE watching the students play this game because they have great conversation about why certain cards are matches, or why other cards are not matches! Meaningful conversation is a HUGE reason why I feel the kids did better than usual on their quiz scores this week. Because of the practice discussing the topic aloud, they reeeeaally know this topic frontwards and backwards! You know how they say that those who know a topic really well can teach others? This goes with that idea. Because of their deep conversations (sometimes they felt a little more like arguments, haha) they have really put this new skill into their long term memory and can explain it to others. My students really loved playing memory! But the next day, I introduced a different game with the very same cards...Go Fish!! There is a record sheet and instructions for Go Fish included in the packet, as well. Most of the kids had played Go Fish before, but I have a few extra rules to make sure they are practicing the skill properly and fully. 2) For example: if they have 0.25 in their hand, then that means they need 25% to get a match. They must not say "do you have twenty-five hundredths" to their partner; instead, they must say "do you have twenty-five percent" because that is the card they are looking for from their partner. 3) ALL matches must be logged by both the student who made the match and their partner throughout the entire game. The person with the most matches at the end is the winner. (I do not give any sort of prize, but usually have winners from different partnerships move around and play other winners). There is also a homework sheet for decimals and percents included in the packet! Some years I use this for homework, simply because I run out of time during the day and would love them to practice quickly at home. 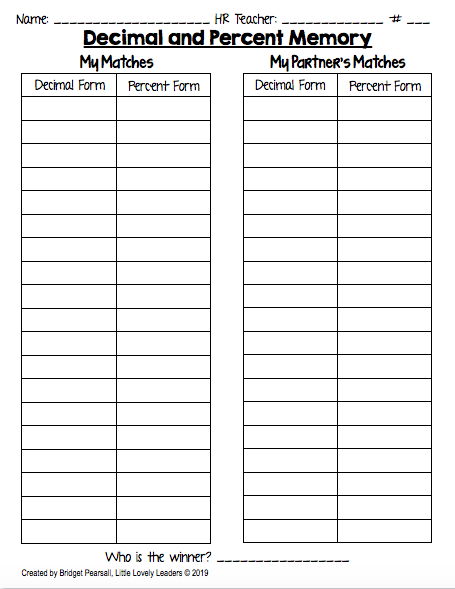 It shouldn't take them more than 10 minutes - it is just a half sheet of paper. Other years, I use this as a quick check before the kids leave my classroom...like an exit slip! This is two games in one! 1. 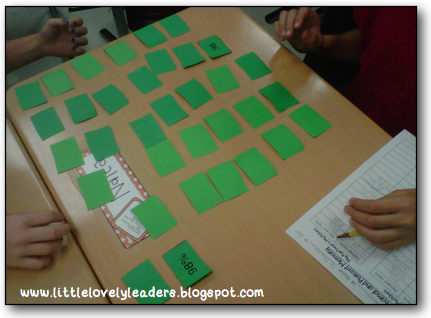 Ordering - I will share with you how I played this game in this way in my class. 2. War! 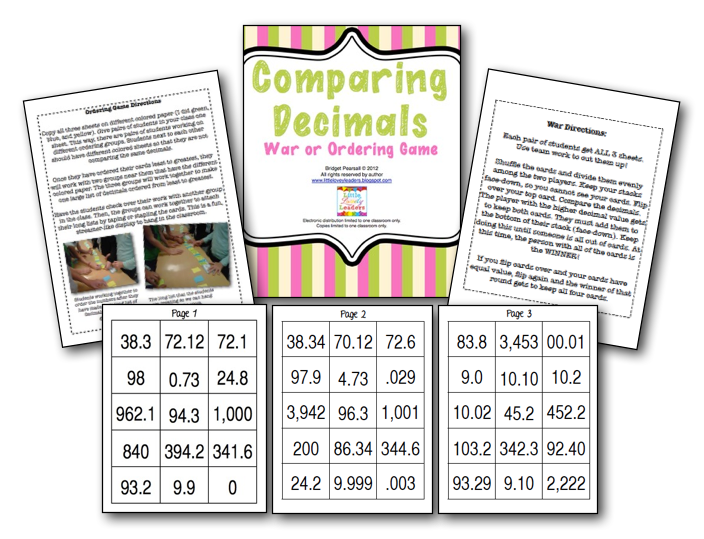 - Old fashioned card game turned into decimal comparing! 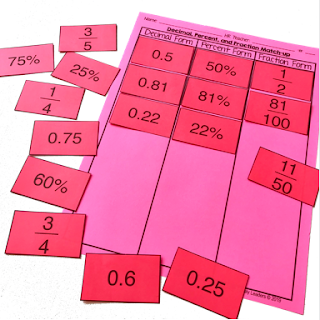 Students cut up all three sets of cards, pass the deck out to two players, and then flip over their cards to compare whose decimal is larger. That player gets to keep the cards! Keep going until someone runs out! I copied each of the above sheets on different colored sheets of paper. Each group of 6 was originally set up into 3 pairs. Each pair of students got a colored paper (so each of the pairs were working on a different set of cards). 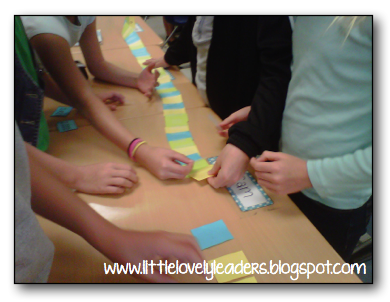 The students worked with their partner to organize their card set into order from least to greatest. Once we did this, we all checked our work to make sure we ordered our cards correctly. I challenged each group to combine their cards and make a long strand of least to greatest order using ALL of their cards at their group! They had so much fun doing this! I was not planning on this, but we ended up taping the cards together afterward so that I could display these long strands on the back of my classroom door! I really enjoyed this lesson! The kids had a great time, and so did I! I really enjoyed watching them learn, as well as listen to their discussions between their groups. There was actually A LOT of meaningful conversation going on! My favorite quote of the day that I overheard was one boy trying to explain to his group that 0.9 was greater than .09 -- he said, "a hundredth is less than a tenth. Think about cutting a cake into a hundred pieces or ten pieces...wouldn't you rather have one of the ten pieces?" 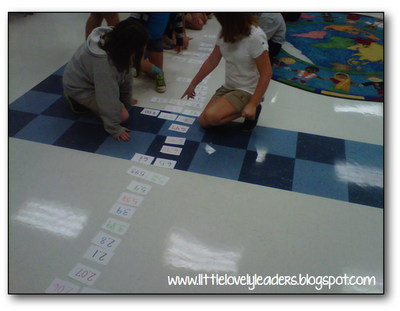 I extended this lesson by writing MANY numbers (and I mean a lot of numbers! I used a WHOLE stack of index cards!) 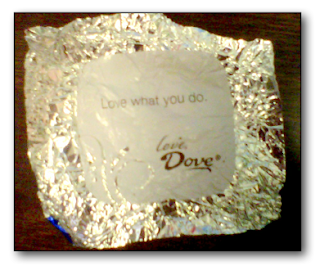 on the backsides of index cards. 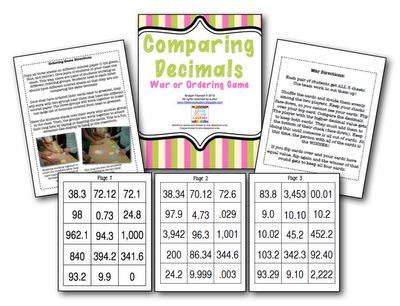 I even included some challenging equivalencies (decimals, percents, fractions) just to test their knowledge. This was so much fun because we went out into the hallway. The class chose 2 captains that were the only people who were able to talk out loud...everyone else had to remain silent! Everyone had about 5 random cards in their hands that they were in charge of placing. 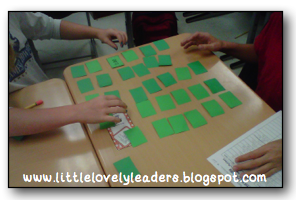 Watching them develop strategies in order to sort these cards from least to greatest was so interesting! I loved every minute of watching them! All of my classes were able to complete this task, and I am so proud of them! They worked SO WELL as a team! 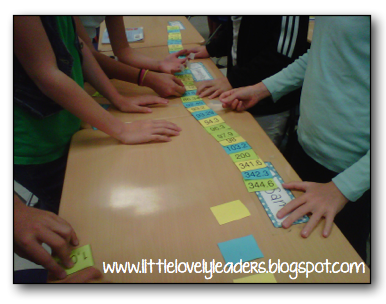 I hope you can find a way to use this little ordering lesson with your students! 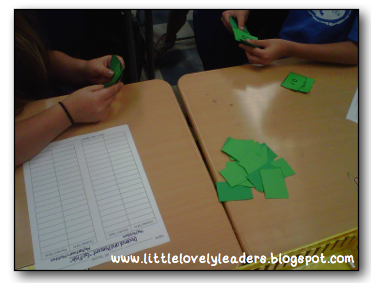 It was so much fun, built team work, and helped them practice ordering decimals! A major bonus was being able to get up and move around! WOO HOO! 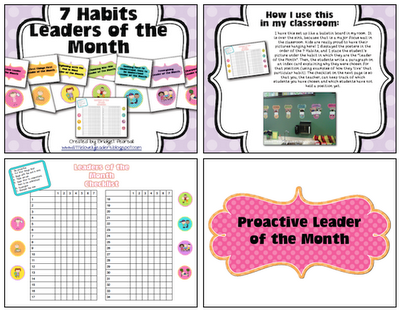 Click here to download the first game for FREE on my TpT site! So I made a really great purchase a few weekends ago and I cannot wait to share it with all of you! 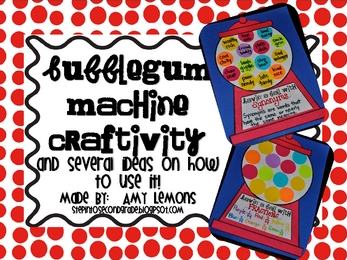 The Gum ball Machine Craftivity from Amy Lemons at Step into Second Grade is A-Mazing! 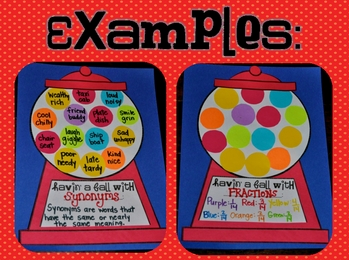 I bought it on a whim because I am a sucker for craftivities...but this is not just a craftivity...I can use this WITH ANY UNIT :) This activity can be used with basically any and every subject! It turned out super colorful in our hallway, as well! Who doesn't love something that can be used with anything? It's like a denim shirt..it just goes with ALL of my colored pants! Amy included everything needed for this creativity! The kids were super independent with their work! I was so excited about it! I showed them a final product that I created, and from there, they worked on their own! They are such little leaders! 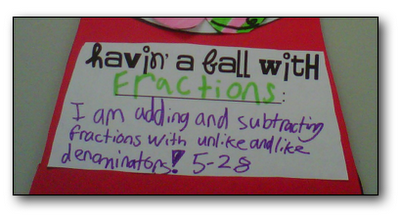 We had just completed the unit on adding and subtracting fractions with like and unlike denominators (I would have to say...probably the most difficult thing I teach all year...). I wanted to reward them with this super-fun craft! I created a worksheet that had 10 problems on it (adding/subtracting with unlike denominators). The students had to complete this worksheet before they could collect any materials for their gum ball machine. However, I made it a little bit more relaxed than usual - we listed to music and could whisper (as long as they proved they could work at the same time). It was really wonderful! 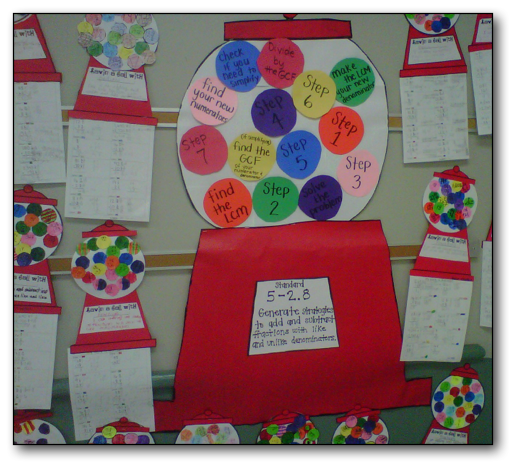 I had one of my classes help me create this extra large gum ball machine to show the school that we know the steps used to solve these fraction equations! 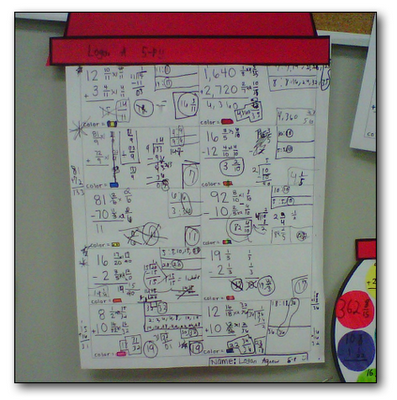 We include the steps it takes to get through simplifying our answers! I wrote the SC state standard on the slot part of this machine. The students wrote their standard on their machines, as well! 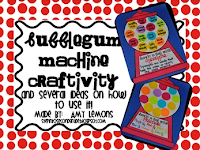 I love this because then when they take their work home, parents will know exactly what we are learning by reading the gum ball machine! I think the font that Amy used for this craft is super cute! I have had these up for a while, but wanted to wait until I had really used them before I blogged about them. As most of you know, I teach at a Leadership school (where the 7 Habits are integrated into everyday learning). 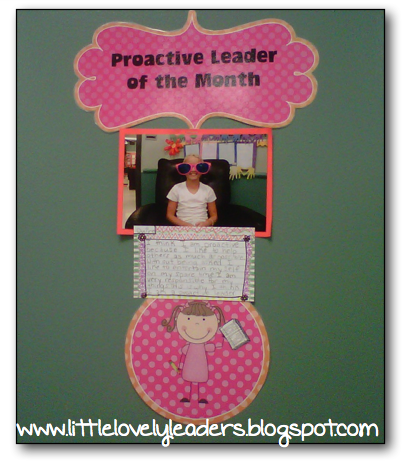 Part of my Leadership classroom is my Leader of the Month board! 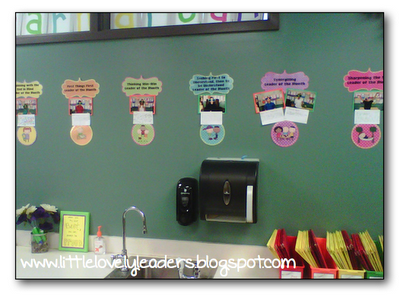 This is favorite wall in the room for a lot of the students, because their silly pictures are posted here! They get to feel special for the month! They earn it, though! :) They work so hard to learn the 7 Habits, so I love to recognize their efforts. 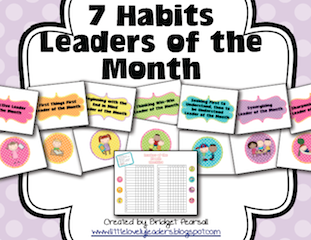 We have a Leader of the Month for EACH habit. I place the student's picture under the habit they exhibited and they write a short description telling others about why they were chosen for that position :) Their responses are extra adorable! These can be used in ANY classroom...not just a classroom in a school where the 7 Habits are implemented. I think that all students should learn these amazing habits. They are really helpful for future success! I just love hearing the students use the terminology, as well, when they have meaningful discussions about the habits. I just felt so good after I read this, so I had to share it!